1. Wet the stain with cold water – If the stain is fresh and still wet, soak fabric in cold water immediately. If the stain has dried, skip to step 3. 2. Rub with soap – Rub the stain well with soap, lathering gently. Don’t make the mistake of trying to show the blood who’s boss. Tip: For light-colored fabrics, dab with a cotton ball soaked in hydrogen peroxide, which acts as bleach. 3. Re-soak the stain with a pre-treatment stain remover – If the stain has already dried, spray with stain-removal solution. Let it soak in. Let the memory of how the blood got there soak in, as well. 4. Dab on diluted ammonia – Rinse the fabric, then apply a small amount of diluted ammonia to the area with a cotton swab. Let sit a minute, then scrub and reapply as needed. 5. Launder fabric – Machine-wash the fabric using an enzyme detergent, which breaks down protein stains. Don’t make the mistake of assuming it breaks down all “protein stains”. Make sure the blood has lifted before putting fabric in the dryer, as the heat will set the stain. 6. Avoid blacklights for the rest of the life of that fabric, just in case. 1. Don’t. The whole point to covering a hotel room in the blood of innocents is to get a reaction. 2. Use Industrial-Strength Cleaning Products – Due to the volume of blood soaking into the carpet and drywall, blast that sucker with the highest grade industrial-strength bleach you can find. Burn everything that remains. *This post lightly adapted from “How to Remove Blood Stains”, Real Simple. 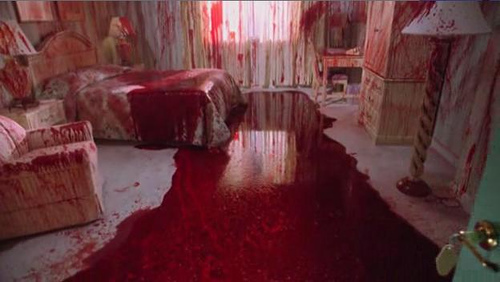 blood, carpet stains, Dexter, Spring Cleaning, stain removers.